When my 19-month-old son Miles was diagnosed with autistic disorder, I put together a course of action to help him, including a behavioral program developed by expert O. Ivar Lovass from a book called Let Me Hear Your Voice. In Unraveling the Mystery of Autism and Pervasive Developmental Disorder, I describe the emotional first weeks after the diagnosis. Intellectually, I had begun to accept the reality of this diagnosis. But my tears came and went in short, unexpected bursts. I was pushed by a sort of momentum that I knew would keep me from feeling any real pain. As long as there was something I could do, I had power. I contacted other local parents who had read Let Me Hear Your Voice and were doing applied behavior analysis (ABA) with their children. A mom named Shari Rogers spent three hours with me on the telephone and described the efforts of a parents group to make such a program available in our area. Speaking with her about our children was almost euphoric for me. I realized how powerful a bit of support from another parent could be. We were both facing the same indescribable horror, and there was an instant feeling of connection between us. Shari advised me that since Lovaas himself was a somewhat controversial figure we should call the therapy ABA or “discrete trial teaching.” Because these parents had been fighting this battle for the few months preceding Miles’s diagnosis, they had made a lot of progress in obtaining appropriate services. With their help, we lined up a therapist, Jill Pavone, who had some recent experience with the program. Early Intervention agreed to ten hours of home-based therapy, eight hours of special nursery school, and some speech and occupational therapy each week. Much to my relief, I discovered that Miles was entitled to this therapy based on his disability, without any out-of-pocket expenses from us. All of this accomplished, I lay in my bed one night, using the darkness to map out my plan of action. The program was going to mean an overhaul in our family life. Every spare moment was going to have to be used constructively. I owned my own retail business—two secondhand children’s clothing stores—and an increase in payroll would probably eliminate my meager profit, but I had no choice. I would have to give my managers a good raise and ask them to take over most of the buying and administration, and start trying to sell the business. Then I would look into hiring an au pair, a live-in baby-sitter, so that there would always be an adult there for Laura. An English girl who likes doing play dough, I decided. As I drifted off to sleep, I felt confident that I was doing everything I should. I was in the woods, searching for my son. There was a crackling of underbrush up ahead. I moved quickly, pushing aside branches as the path disappeared into a thicket, then I heard a monstrous roar. Fear gripped me. I couldn’t see, but my feet were flying over the ground. Then, suddenly, I tripped and fell hard. I looked up and in the distance saw the outline of a solitary baby boy, toddling slowly toward the sound. Alan sat up in bed. I began to wail. Over and over I howled uncontrollably. As if all of the air in the room was being forced through my body, I howled and howled and howled. “Karyn, what is it? What’s the matter?” Alan asked, frightened. He grabbed my shoulders. The pain was searing. I cried for Miles, I cried for Alan and myself, and I cried for every family that had ever lived through this nightmare, this anguish, this cruel and perverse torture of watching one’s own child disappear into himself. 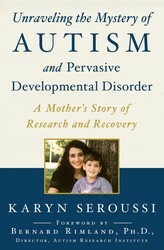 Unraveling the Mystery of Autism and Pervasive Development Disorder is an essential guide for parents with autistic children who hope to better understand and intervene with the disorder.When their nineteen-month-old son, Miles, was diagnosed with autism, Karyn Seroussi, a writer, and her husband, a scientist, fought back with the only weapons at their disposal: love and research. Consulting medical papers, surfing the Web, and networking with other parents, they traced the onset of their son’s problems to an immune system breakdown. So Karyn and her husband got to work—Karyn implementing their program at home while her husband tested his theories at the scientific lab where he worked. Unraveling the Mystery of Autism and Pervasive Developmental Disorder is an inspiring and riveting chronicle of how one couple empowered themselves to challenge the medical establishment that promised no hope—and found ways to help their child. Karyn Seroussi, a freelance writer, has spoken at conferences around the world, helping other parents understand what is beginning to be known about the nature of, and the treatments for, autism. Her goal is to see parents and professionals working together; to have autism diagnosed early and treated appropriately. You can visit her website at KarynSeroussi.com.